“I love the challenge and the joy of trying to catch time and space and energy in a jar—like a little kid and lightning bugs,” said Dean Taylor Drewyer, commenting on his approach to painting. An alumnus, Drewyer received his Master of Fine Arts degree in Painting from the George Washington University in 1986. He has been exhibiting his paintings in the Washington, D.C. area for more than 40 years. He paints western Loudoun landscapes, Potomac riverscapes and eastern Maine scenes. While studying at GW he was awarded the David Lloyd Kreeger Purchase Award for painting, as well as a Graduate Teaching Fellowship. He studied under well-known faculty including William Woodward, Professor Emeritus of Fine Art and the late Professor Arthur Hall Smith, who was his thesis advisor. He exhibited his graduate thesis work at the Brady Gallery, located on GW’s Foggy Bottom Campus. 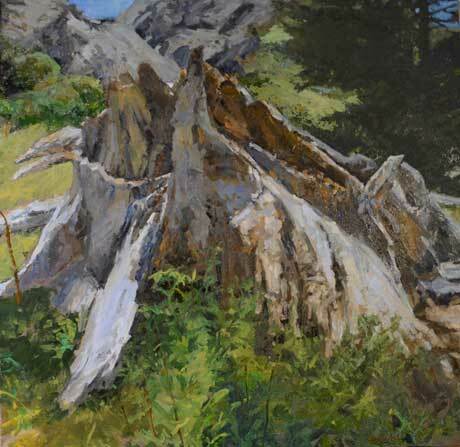 Drewyer has been exhibiting his paintings since the early 1970s. 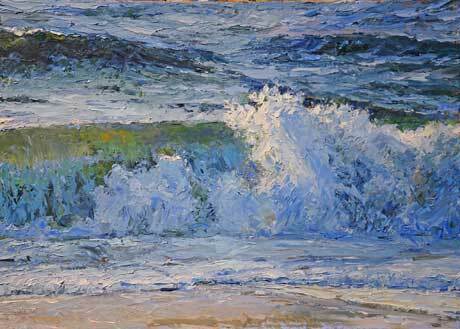 His drawings, watercolors, and oils can be found in public and private collections throughout the mid-Atlantic region. Over the years in the Leesburg area he has exhibited his work at the Rose Gallery, Gallery 222, ArtSquare, and was a founding member of The Washington Collection of the Fine Arts. His most recent pleine-air work is based on locations along the upper Potomac river, the Virginia Piedmont, the Blue Ridge and the low mountains of western Maryland, and on or near the lakes in Maine. Whether standing in an open field, knee deep in a stream in the woods, or floating on the lake in his aluminum rowboat, Dean works in a rapid wet-on-wet style in oil, concentrating on capturing the 'premier coup' - seldom returning for a second day on the same work. This approach lends a spontaneity and freshness to the paintings while rendering the feel of time and place. Brush handling, the thick viscosity of the paint, shadow and light, and color with its atmospheric / spatial effect are his primary concern. The chosen subject is simply a visual trigger to discover and record these dynamics. Additionally, Drewyer has recently retired after 32 years with Loudoun County Public Schools. In 1992 he was awarded the Washington Post’s Agnes Meyer Outstanding Educator for Loudoun County. Drewyer taught advanced studio classes at Loudoun Valley High school for the last twenty two years, including 20 years as the Chair of the Fine Arts Department. In 1987 he served as Loudoun County Public School’s first county–wide Art Supervisor. In the 1980s, he was integral in starting the summer arts program for students that has since grown into the area’s “Summer in the Arts." In the 1990s, he also taught drawing as an adjunct for both George Mason University and the Northern Virginia Community College, Loudoun Campus. Mr. Drewyer makes his home and painting studio with his wife of 42 years, Paula, and son, Dustin, in the old Hughesville Church and School, just outside Lincoln, Virginia. For more information, contact the artist at [email protected], check out his online portfolio of works or visit his painting blog. HIs exhibit is on display through September 5, 2016 at the GW Virginia Science & Technology Campus, Enterprise Hall, 44983 Knoll Square, First Floor Gallery, Ashburn, VA 20147. It is free and open to the public.